David McDaniel, Forgotten Books, The Man From U.N.C.L.E. THE FINAL AFFAIR by David McDaniel was an almost never was, just barely was book that was originally supposed to be published in the late sixties as a finale to The Man From U.N.C.L.E. paperback series. The series was canceled and the book finally saw publication in November, 1984 from a small publisher called Extequer Press in hardcover. At least that’s what I get from two sources. A third I ran across says it never made it after all. There is an ISBN number assigned to it(both previously mentioned sources have it), but I’ve never found a copy, not even a cover image anywhere I looked. I’ve searched for years and thought I’d found a copy listed on Amazon for $35. I jumped on that deal, but what I got instead were seven of the old paperback series. I got my money refunded(why would I pay that amount for seven books that I already owned for which I’d paid fifty cents a copy) and kept the books as well. What I do have is a copy of McDaniel’s manuscript which has been around for years. McDaniel’s U.N.C.L.E. novels were the most popular and the best selling of the series. Whenever he turned in a finished book, he was given a contract for the next one. THE FINAL AFFAIR was planned to tie up loose ends, since the TV series was winding down, and be the last book(though J. Hunter Holly had one that suffered the same fate; it was later published in a fan magazine). His previous novel had been the last one commissioned by Ace, the publisher just releasing books from the British series that had never seen American release after that. McDaniel and editor Terry Carr had cooked up the idea of winding things up. McDaniel was several months late with delivery of the book, though, and a number of changes had taken place in the interim. Ace’s founder had died and the imprint was sold. Terry Carr had resigned and the ms was placed in editor-in-chief Donald Wollheim’s hands. He passed since recent sales had lagged and the series was done. Wollheim later learned the book was under contract and half the advance had been paid. He’d thought it was freelance and admitted he’d have published it if he’d known they already had paid money on it. Now on to the plot. McDaniel had built a consistent background over the course of his six published U.N.C.L.E. novels. Their arch-enemy Thrush had evolved from the remnants of Professor Moriarty’s criminal gang after his death at Reichenbach Falls. During WWI, a young Alexander Waverly rescues a wounded Ward Baldwin. Baldwin later on joins Thrush. In THE FINAL AFFAIR, we learn Napoleon Solo had been married twice before joining U.N.C.L.E. Both organizations had targeted him with potential very young in his life. Thrush sent an agent to get close to him. Joan was her name and they ended up marrying. She was supposedly killed while he was away on military service, instead returning to her life as a Thrush agent. His second wife was killed in a car accident. He reunites with Joan who defects from Thrush. U.N.C.L.E. manages to plant a virus in Thrush’s three revolving Ultimate Computers, thus destroying most records and throwing the organization into disarray. They learn the location of Thrush Island and launch an invasion. Things are pretty much over for Thrush after that and U.N.C.L.E. starts making changes as well. Illya Kuryakin returns to Russia and Napoleon Solo becomes the new Number 1 of Section 1. I wouldn’t mind seeing a paperback edition of this one published. Not likely though. The show is old and most fans are like me, old along with it. Possibly, if the rumored movie by Tarrantino ever gets made(he’s professed a desire to turn The Doomsday Affair by Harry Whittington into a film). But since that rumor has pretty much been dead for a number of years, it doesn’t seem likely to happen either. The photo here is McDaniel from November, 1974, just a few years before his death. update: The Final Affair is now available on the net TO READ OR SAVE. Loved that show and what an interesting tale on tracking it down. Interesting mystery. Sometimes the stories behind the stories can be as mysterious and hard to figure as the ones between the covers. A friend of mine has a copy of this manuscript, too, and is quite pleased to have even that much. She, too, is of the opinion it was never published. Just ran across this. 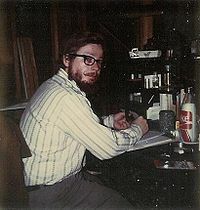 I knew David McDaniel (his real name, but he went by “Ted Johnstone” in science fiction fandom, for some reason) in Los Angeles in the 1970s, and still remember my shock when I heard of his early death. In any case, Gavin Claypool’s Extequer Press (he was a Cal Tech grad; thus “ex-Techer”), which had brought out a collection of Jerry Pournelle colums, was supposed to publish _the Final Affair_; he’d gotten as far as typesetting, producing a cover design, making t-shirts (I have one) – and, if you’re right, assigning an ISBN number. Then – as I understood it – he got a cease-and-desist letter from MGM, and while Gavin hoped to work through the issues, I never heard of the project going any further. One of the Star Trek paper series had a plot line where Spock wrote his own security software and Spock became concerned when the UFP erased someone he knew from all computers. By the description of how the UFP erase program operated and propagated we would call it a virus or a worm today. I do not know the name of the book, it was my younger sister’s and she sold all of her trek stuff over thirty years ago. I suspect that may be the first mass publication mention of computer security and unauthorized data deletion. The first use of the term “virus” in a computer context that i came across was in David Gerrold’s “When Harlie was One”, published in 1971 or 1972. Likewise, the earliest use of the term “worm” that i can recall encountering was in Brunner’s “Shockwave Rider”. You are right, Steve. It’s been a couple of years since I read the manuscript. I think it was described as a “link” to the Ultimate Computers. I think “virus” has become a part of the lexicon and what came to me when I was writing. That explains it then. It’s interesting to see how that handling of computers in fiction (and television) has evolved over the years. When UNCLE was on, the visual language of computers was big cabinets, flashing lights, spinning tape reels, and printouts on narrow paper tape. I wonder what was the LAST show to use the big computers with the tape reels? Interesting question, Steve. I can remember when early computers took up whole rooms. I wonder if any SF writers ever pictured computers back then as just another appliance in a lot of homes. Those who wish to research McDaniel/Johnstone in LA fanzines of the sixties would want to know that he was frequently referred to as “Tedron”, and that he was involved in the whole Coventry kerfuffle. But that’s another story, for another time, and I don’t know enough about it. So….how does one lay hands on a copy of this elusive manuscript? Further input: As i understand it, the small press in question had cleared the rights to publish a limited edition (500 copies or so) of “The Final Affair”, and the word was that money problems forestalled it. Fairportfan is mistaken. The actual authors referred to were Buck Coulson and Gene DeWeese. McDaniel reversed their names. I have a copy of The Final Affair which I bought on Ebay about 5 years ago for $ 75. I READ Ted’s manuscript after he wrote it while at his house in LA years ago as well. Someone is currently selling a version of it on Ebay for $ 60 with a front and back cover reminiscent of the Ace novels with even a description of the book like we would see on the back of the U.N.C.L.E. books. I have looked all over the SF Bay area and on the web for U.N.C.L.E. & T..H.R.U.S.H related materials and I don’t think the book exists in a professionally printed form either. As I recall, Terry Carr got Ace to pay Ted for the book even though Ace had canceled the series. I was in fairly regular contact with Ted before he died and he never spoke of it to me. If anyone knows the whereabouts of Don Simpson, could someone let me know. I’d like to get the specifications for the T.H.R.U.S.H. cane he had made for Dean Dickensheet. I was working through the late Buzz Nelson to talk to Shirley Dickensheet but then they both died within a relatively short time of each other. I walk with a cane and it would be nice to have one with a T.H.R.U.S.H. logo on it, though of course, without the sword cane in it, which is illegal under California law. A fan I am dealing with is designing a T.H.R.U.S.H. badge for me and was going to make a T.H.R.U.S.H. uniform for me so I could wear it to Conspiracy Con. I got sick & then he got sick but it’s back on again. I miss Ted a lot and think about him often. By the way, according to news I saw yesterday Steven Sonderberg is supposed to be working on an U.N.C.L.E. movie with George Clooney participating in the project. I’ve left a lot of U.N.C.L.E. related posts on my blog over the last couple of years. You can find Don on Facebook, believe it or not. Me to for that matter, should you be interested. A THRUSH cane in not one of the things I made for Dean Dickensheet, and I don’t remember him having one. Late to the party here, but for what it’s worth, the manuscript that is circulating as a pdf is genuine; I know because it is a copy of my copy of Dave’s carbons, which he gave me back in 1971. Years later, after Dave’s death and the failure of the ExTecher project, I offered my copy to a friend in fandom to be published and distributed for cost, with the caveats that my “original” return to me after it was reproduced, that Dave’s wife be consulted for permission, and that it would be distributed for publishing costs only. I thought fans should have the chance to read it, and thought Dave would be pleased. I still think he would be. Apreciate your making the manuscript available, Dianne. I have one of those typewritten copies from years ago. Sorry Dianne, but you are quite mistaken. The pdf of ‘The Final Affair” that is online is a copy of one of the ones made by Bob and I. It is definitely NOT a copy of a carbon paper copy. The quality alone proves that. The fact that you can see slight reproductions of the holes on the far left side made by a three hole punch should also make clear that this copy is NOT made from a carbon paper copy. there is evidence from someone at Ace Books that the actual book never saw light. They apparently bought the book from Ted and never paid him for it because the new owner was too cheap to pay him. That editor said that if he’d realized they owed Ted the money they would have paid him. And yes, I know he was really David but I tend to think of him with both names in my mind. – What’s sad is that Dean and Shirley Dickensheet have seemingly dropped off the radar screen since their deaths. I used to be able to find references to them on the web because Dean and Shirley were prominent Sherlockians. Now there’s nothing. I suppose only those who remember people and bother to post something after their friends die give someone a sense of internet immortality these days. By the way Randy… the photo credit on the one photograph you include here of Dave should be “Photograph by Bill Mills”. I took this and several others in McD’s cramped little ‘office’ space in his Santa Monica apartment. There are darned few photos of David, period. So I am delighted that one of those few that gets reprinted often is mine… but I wouldn’t mind a little credit for it… after all of these years. And for you information (and posterity) Bob Short and I used the psuedonames Andante Nemo (Bob Short) and Vaughn Carazini (Bill Mills) for years as our U.N.C.L.E. agent character names. We had been become very close friends with David in a very short time and when he finished ‘The Final Affair’ he actually asked US for permission to use the names to infer that that was, in fact, the real names of real agents from which the characters known as Napoleon Solo and Illya Kuryakin were drawn. We were honored and proud to be included in ‘The Final Affair’. I, for one, am still. I have enjoyed reading through the posts here and I thank you and all of your posters for the treat it is for an old U.N.C.L.E. agent… er, fan like myself. Thank you most sincerely, Randy! You may be interested to know that there are a few rare recordings of David playing guitar and singing a few ‘Filk Songs’ on my fannish web site ‘The Voice Of Fandom’ at http://thevoicesoffandom.com AKA http://TVoF.info, on the Fannish Music pages. i am taking care of Joyce McDaniel, David’s wife at the time of his death. so i am trying to learn as much about him as i can. she is in the last phase of her life and is in and out of the hospital, i am trying to track down all of the Man from Uncle books and anything that David wrote, for her for Christmas. thank you for all the information I am sure that Joyce will be surprised.